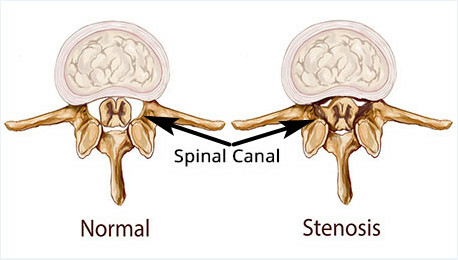 Spinal stenosis refers to a narrowing in the spinal canal. This occurs when the nerves that travel through the spinal canal are compressed. In the cervical and thoracic spines, this could involve spinal cord compression. In the lumbar spine, this more typically involves lumbar nerve compression. Spinal stenosis is caused by disc bulging where the disc prominence can press on the spinal nerves and also can be secondary to a thickened ligament that is found on the back of the spinal canal that can push forward, as well as enlarged facet joints that also can push forward and compress the spinal nerves. The result is a sandwich effect where the bulging discs, sometimes with bony spurs and pushing backward on the nerves and enlarged facet joints and thickened ligament, called the ligamentum flavum, pushing forward, creates a narrowing in the spinal canal. The regions under the facet joint, called the lateral recess, are especially common areas of nerve compression, also the central area of the spinal canal as well as the exiting portion of the nerve, called the foramen, also can have nerve compression. Modern evidence would suggest that the disk degeneration, that often can be result of wear and tear and/or genetics, is the initial event that leads to the development of arthritic facet joints and the development of spinal stenosis. Other causes of stenosis can occur including tumor calcium pyrophosphate crystal deposition, amyloid deposition, as well as congenital stenosis where people are born with an abnormally small spinal canal. Asymptomatic spinal stenosis is extremely common and in fact, probably ubiquitous with the aging spine. Patients who develop symptoms of spinal stenosis typically have pain in the back, often buttocks, thigh, and/or leg pain, worse with standing and walking, and improved with flexion or sitting. Some patients will have numbness as well. Additionally, patients will describe a catch phenomenon; whereby, after being seated for a while, they transition into a standing position and develop severe similar back, buttock, and/or leg pain. Because patients with spinal stenosis can typically tolerate flexion better than extension, patients often lean forward or sit to gain relief. A shopping cart sign is where a patient obtains relief from bending forward and using the cart. Flexion with sitting or bending forward slightly improves the space available for the nerves and may improve vascular blood flow. Ultimately, the nerves that are mechanically compressed become inflamed and symptoms can occur more commonly, the symptoms develop gradually as the spinal canal increasingly narrows. The nerve’s blood supply that travel are also compressed causing a condition of decreased circulation to the spinal nerves, the resultant sciatic type nerve pain that occurs in stenosis. Spinal stenosis is a clinical diagnosis that is made with taking a thorough history and physical examination from the patient. If the patient has signs and symptoms of spinal stenosis without any significant neurologic weakness or signs of spinal cord dysfunction, then typically, the patient may be referred to nonoperative care such as physical therapy, chiropractic care, and/or an exercise program. For persistent symptoms, advanced imaging is generally recommended. These include simple radiographs, computed tomography, or CAT scan, as well as magnetic resonance imaging, or MRI, to determine if indeed, the patient does have spinal stenosis. Occasionally, a myelogram, which is an older study, whereby dye is injected directly into the spinal canal with followup radiographs and/or CAT scan is used. An EMG, or an electromyographic testing, may also help to determine which nerves are involved or to rule out other neurologic disorders. Most patients who do not have any significant neurologic weakness will benefit from anti-inflammatory medications and physical therapy and/or chiropractic care. For patients who have refractory symptoms, temporizing x-ray-guided epidural corticoid steroid medication injections can be beneficial. Significant research suggests, however, that with symptoms that are persistent over longer periods of time, that decompressive surgery offers the best longterm treatment. The benefits of surgery must outweigh the risks for an individual patient.